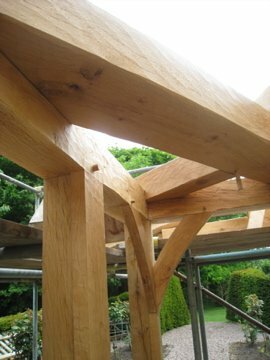 Often, Altham Oak’s professional craftsmen find that their input is required beyond their original brief. 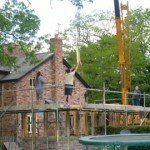 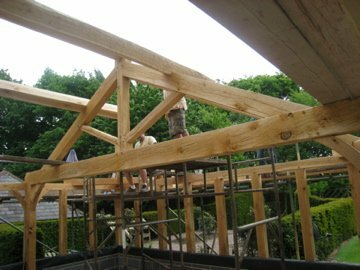 In creating a large garden room extension for a property in Cheshire, their experience in structural design and engineering calculations was invaluable in delivering a successful project. 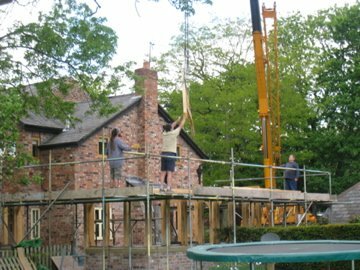 As part of the work on a large private residence in an affluent area of the county, Altham Oak were charged with the structural oak carpentry work for a substantial extension to the rear of the house. 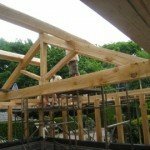 An architect and a builder had already been selected to work on the project and various calculations, design plans and drawings of individual oak components had been produced, prior to Altham Oak’s involvement. 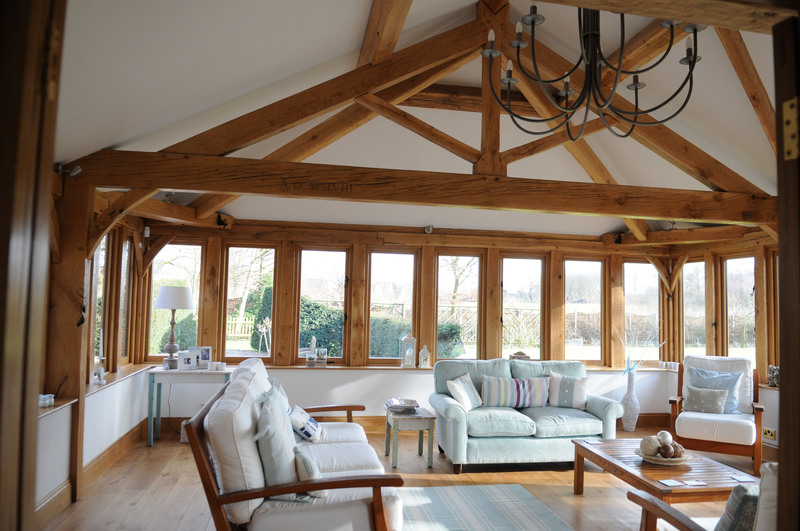 To ensure the finished project was closer to the client’s original desired vision, a revised design for the internal frame in green oak was carried out. 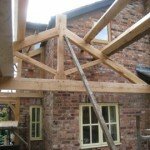 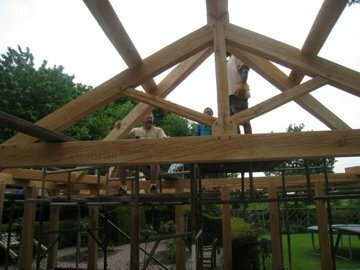 The first element of the scheme to be developed was the large twin oak king post truss to support the other structural components. 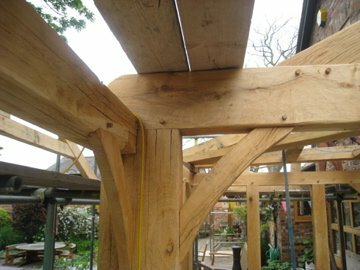 The initial quote of approximately £36,000 was reduced by around ten percent to allow for the removal of decorative oak features no longer required followed a project review. 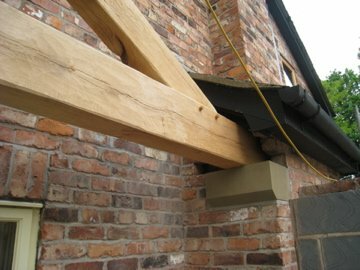 Measures were taken to ensure that the weatherproofing performance of the green oak walls wouldn’t be affected by the shrinkage of the timber over time. 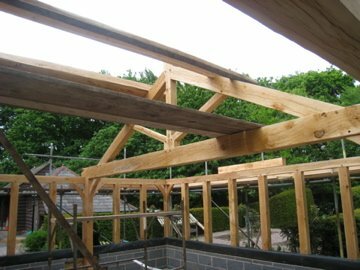 The impressive dragon ties lift the bottom of the hip rafters to give headroom in the corners of the newly created space. 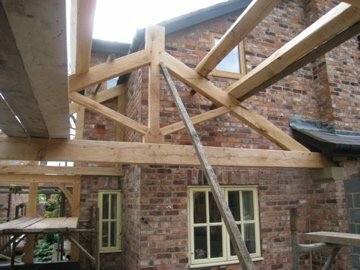 Following the development’s satisfactory completion, Altham Oak were entrusted with a further project for the same client, creating three oak trusses, purlins and beams for an annex to the existing property. 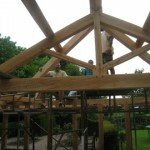 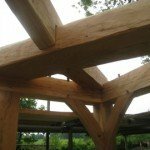 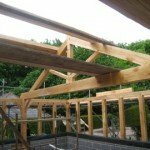 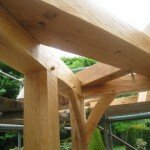 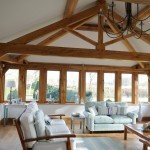 We welcome enquiries from clients with small projects such as a Fireplace Beam; larger works such as a King Post Truss Roof or Oak Orangeries, to once in a lifetime projects such as an Oak Framed Building. 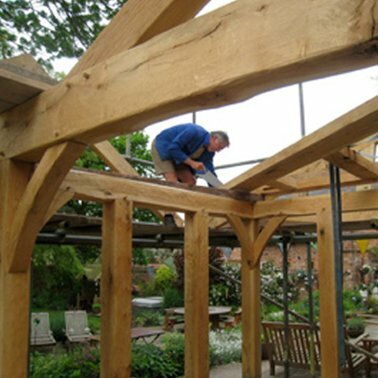 We source our timber sustainably wherever possible and only stock logs from responsibly managed woodlands. 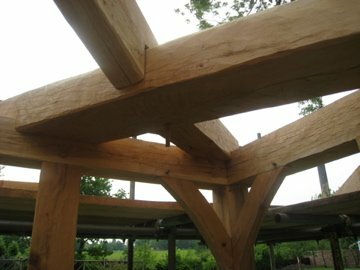 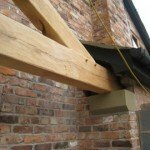 Altham Oak is committed to using curved logs which would be rejected by other framers, this gives added grain strength. 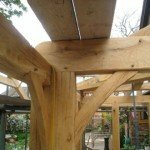 We find innovative uses for our off cuts and waste very little of the beam sections, see our facebook and twitter page for details.